BlogHome » Blog » “Clarifying” the Dominus Flevit tomb part 2: Is this the final resting place of Simon Peter? Based upon the extant historical sources there appears to be unanimous agreement that Peter–Simon bar-Jonah–died in Rome during the persecutions of the Roman emperor Nero which took place during the years 64/65 C.E. The same sources agree that he was buried in Rome, where his grave was commemorated by a monument. Clement Bishop of Rome (88-97 C.E. ): There was Peter who by reason of unrighteous jealousy endured not one but many labors, and thus having borne his testimony went to his appointed place of glory. (1 Clem 5:4) He was the first to mention Peter and Paul’s martyrdom at Rome. Attributed to Origen (c. 230 C.E. ): “Peter appears to have preached through Pontus, Galatia, Bithynia, Cappadocia, and Asia, to the Jews that were scattered abroad; who also, finally coming to Rome, was crucified with his head downward, having requested of himself to suffer in this way” (in Eusebius, Ecclesiastical History 3:1). Eusebius bishop of Caesarea (c. 325 C.E. ): “Thus Nero publicly announcing himself as the chief enemy of God, was led on in his fury to slaughter the apostles. Paul is therefore said to have been beheaded at Rome, and Peter to have been crucified under him. And this account is confirmed by the fact, that the names of Peter and Paul still remain in the cemeteries of that city even to this day” (Ecclesiastical History 2:25). More extensive accounts of the events which surrounded his death and burial are filled in by various apocryphal sources. These stories have forged much of the legends that have been used to inspire the imagination and faith of believers over the centuries. The historicity of these stories are now left in the hands of modern historians to interpret and evaluate their likelihood. The most important of these stories is the second century Acts of Peter, where Peter insists on being crucified upside down because he did not feel worthy to die in the same way that Jesus did. In the early fourth century, the Emperor Constantine built a basilica in honor of St. Peter at the site of his grave, today known as St. Peter’s in Rome. It has been traditionally understood that his relics (his bones) lay buried below the high altar of the Basilica. Another tradition placed his skull in the Basilica of St. John Lateran on the Lateran Hill in Rome. All traditions without exception place his remains in Rome. Under subsequent investigation by a physical anthropologist, the bones of several individuals (including a woman and certain farm animals) were identified, bringing into question the authenticity of the find. 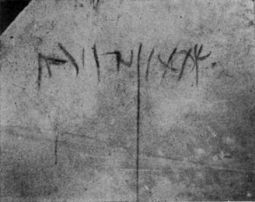 Not long after this, what appeared to be an amazing and conflicting discovery was made in Jerusalem by the Franciscan Father Bellarmino Bagatti in the area of the Dominus Flevit Church on the Western slope of the Mt. of Olives overlooking the Kidron Brook and the Temple Mount. 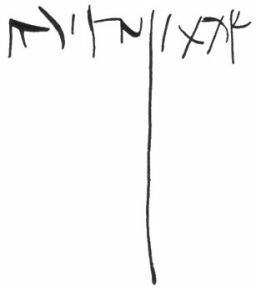 Among the burial caves at the site numerous ossuaries were discovered with what he considered to be early Christian symbols including the Christogram (Chi Rho). 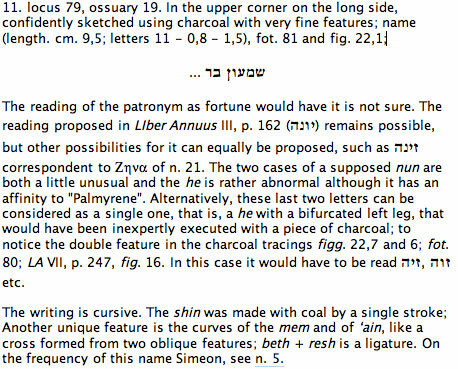 Even more shocking to his mind was the discovery of the remnant of an ossuary bearing the Hebrew name of St. Peter, Shimeon Bar Yonah “Simon, Son of Jonah”. He first published the find in 1953 in Liber Annuus III, 149-184. This, of course, caused some concern since the discovery ostensibly contradicted the finds that were announced in Rome. Fr. Bagatti left the final publication of the ossuary in the hands of Jozef Milik and asserted that the inscription might be of someone from Simon Peter’s extended family, where such a repetition of names might be considered normal practice. Milik published the final report of the inscriptions of Dominus Flevit in 1958, Gli Scavi del “Dominus Flevit” parte I. The following is a translation of Milik’s treatment of the ossuary in question. A decade later, Pope Paul VI announced afresh the finding of the relics of St. Peter, this time in the adjacent “Grafitti Wall” below the altar. The Pontiff held the relics for nearly 14 years before he made the announcement. Why the delay? “According to officials the reason for keeping the discovery secret is that the Pontiff, before making the announcement which, they said, will certainly be of tremendous interest for both Roman Catholics and non-Catholics, wants his archaeological experts to gather proofs so incontrovertible that no one will be able to challenge their authenticity. Accordingly, tests were said to have been made, the nature of which was not disclosed.” Finally the Pope released the following to the press, “We believe it our duty, in the present state of archaeological and scientific conclusions, to give you and the church this happy announcement, bound as we are to honor sacred relics, backed by a reliable proof of their authenticity. In the present case, we must be all the more eager and exultant when we are right in believing that the few but sacred mortal remains have been traced of the Prince of the Apostles, of Simon son of Jonah, of the fisher-man named Peter by Christ, of he who was chosen by the Lord to found His church and to whom He entrusted the keys of His kingdom until His final glorious return.” Text of Announcement by Pope Paul VI Concerning the Relics, The New York Times, 27 June 1968. The authentication of the tomb and its bones has not convinced everyone. This includes the makers of the Lost Tomb of Jesus, who believe that, in spite of the lack of any ancient literary support, the fragmentary bone box of Dominus Flevit contained the remains of Simon Peter who was buried, they assert, not in Rome, but in Jerusalem. Is Simon Bar Jonah really in this tomb? We shall see over the next days.